"Mons Meg" was built in Mons in Belgium. "Meg" is a Scottish short form of "Margaret". 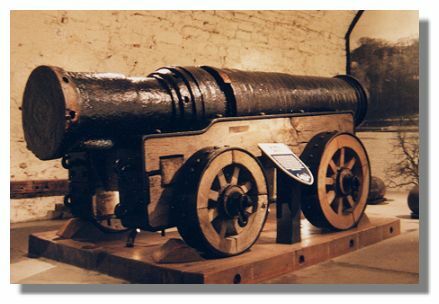 The gun, one of a pair of a type known as a "bombard", was presented to King James II in 1457. It looked impressive and packed a punch as a siege weapon - the missiles it fired weighed 330 pounds/150kg and they travelled a distance of two miles. But it was unwieldy and was difficult to move around, especially in the days before proper roads were built. It was retired to ceremonial use but the barrel burst in 1681 and had to be repaired (it has never been fired again). At one stage it was on display in the Tower of London but was returned to Edinburgh Castle in 1829. It is now a popular attraction in the castle. See also Did You Know? Mons Meg for more information. or go to the next Edinburgh location: Murrayfield Stadium.